Thanks for booking your adventure day with us – we can’t wait to see you all! The new Laser disclaimer form and registration form needed can be downloaded here: at the bottom of the page. You need both forms filled in. If you have filled a registration form in during the last 12 weeks and there have been no changes since the last visit then we will not need this one, but we still DO need the Disclaimer form – Please use the one on this page as the form has recently changed. We have plenty of forms for you to fill out on arrival on site, so don’t worry if you do not get to print the forms off in time. Please note if your child has any medical issues that require any medication such as Asthma, nut allergy etc, they MUST have the medication with them in order to play on the day. We are unable to allow any children take part without the necessary medication to treat their medical condition. If your child is asthmatic and doesn’t have their inhaler they will be unable to take part regardless of when their last attack was, this is a health and safety requirement and an insurance requirement. Please note children with any broken bones or casts can not take part! The adventure day is from 9am – 5.30pm. You can drop the kids off from 8.55am at the forest shelter in the woodland. Please park up and walk up the concrete track to the forest shelter to sign your child in. Once signed in you will hand in your disclaimer forms and registrations forms. At 9am, the kids will start the safety briefing, begin kit up and weapon issue. Once kitted up and ready the safety brief will begin and weapons training will commence. We will then form the teams and then brief the first mission and send you on your way. Throughout the rest of the morning session, other mission objectives will be given to you and the awesome gaming will continue until the end of the morning session. The games are pretty full on and immersive so it will be action packed. We will then break for lunch where a selection of hot food, snacks and refreshments are available to buy from the Forest Cafe. After Lunch we will then be playing some of our advanced missions we which we don’t usually get to play in our birthday party sessions as time doesn’t permit. These advanced ops specifically for our adventure day players require team strategy, communication and tactics and are awesome missions that the kids will love. We also use bigger areas to play the missions and the kids will be immersed in game play for hours. At 5.15pm we will return for team photos, dekit and debrief and the kids will be ready for pick up at 5.30pm. Please walk up to the woodland and sign your child out. Depending on the time of year players will need to wear appropriate outdoor clothing – there is no such thing as bad weather just bad clothing! For winter months we recommend warm layered clothing, waterproof coat/Jacket, old clothes you don’t mind getting muddy and grubby in the woodland, trainers or walking boots only – no open toed/open heeled shoes. Shoes must have adequate ankle support for outdoor use. Thin gloves, and anything else to keep players warm. In summer months we recommend long trousers (we are a woodland and insects live int he woodland), long sleeved t-shirt, trainers or walking boots only – no open toed/open heeled shoes. Shoes must have adequate ankle support for outdoor use. Yes, your child can bring a packed lunch (Big hearty one!) or they can purchase food from our Forest Cafe, please make sure your child brings change! We ask all children bring a drink in a re-sealable container. We provide plenty of water and squash throughout the day, so they can fill up anytime. How do we order dogtags? Dog-tags allow player perks during games and are collectable. 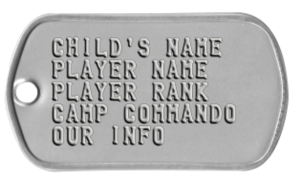 Each time your child attends they can purchase a dogtag to allow them to move up ranks. They are military grade and are a great momento of the day! Dogtags must be ordered by 8pm the night before the adventure day at the latest. They are £3.99 and you pay cash on the day. 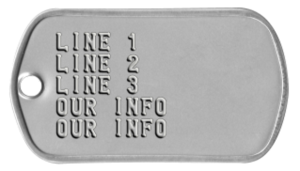 If ordering a dogtag, please email over the info for lines 1-3 to us at lasergaming@oxfordadventurepark.com Dog tags will be issued at the end of the day in the player de-brief. If it is your child’s first tag, they will be private. If unsure, please let me know what rank your child is already and how many tags they have at this rank and we will adjust accordingly. Personalised tags – There are only 13 spaces on each line. Each character, symbol or space takes up a space. Line 4 & 5 our info. Please follow the signs for Oxford adventure park and then park int eh carpark and walk up to the woodland.